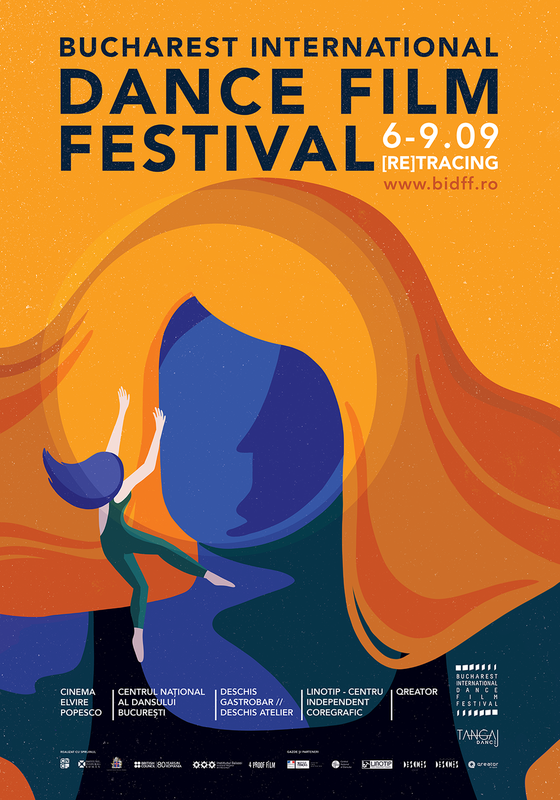 „The forth edition of the festival comes in a time in which we are forced to fight for normality, rethinking the coordinates of the past in order to understand the future. Dance and film meet on equal grounds to showcase stories about resistance, persistence and courage. We are on a search and find quest for ingenious means of archiving the collective memory, but also daring speculations about the future, through which we offer a context of repositioning of the <<individual>> in relation with <<the many>>, even though that means to willingly alter the <<given truth>>. I think by positioning an individual against the history of the masses, we can generate a real creative conflict regarding our ideas and perceptions, one that could be able to restructure the uncertain facts of the present. By showcasing a complex programme, that gathers artists from different fields and geographical areas, we want to challenge the public to try out an exercise of imagination, that will enable the audience to (re)live the reality on three vectors: the temporal, the emotional and the psychological." Blessed with astonishing power and poise, Sergei Polunin took the dance world by storm and became the Royal ballet’s youngest ever principal. At the peak of his success, aged 25, he walked away, driven to the brink of self-­‐destruction by stardom – his talent more a burden than a gift. Here is an unprecedented look into the life of a complex young man who has made ballet go viral. Urban rebel, iconoclast, airborne angel, Sergei is transforming the shape of ballet as we know it. In the year marking the Centenary, we bring forward a unique itinerary in what constitutes the timelines and spaces of creative choreography, so as to offer a dynamic image of the Romanian dance and film avant-garde, through the screening MIDNIGHT SPECIALS | A selection of Romanian archive dance films. A Museum (Theatre) is a participative installation inspired by Heiner Müller’s play Hamlet-machine. This text is about the History of the XXth century and especially about the history of the communist dream and its collapse. This international installation offers the opportunity to stage oneself in a political and poetical self-portrait, to experiment a creative process, to create a micro-fiction. On the border between theatre, dance and visual art, this installation enables the participants to reveal their generosity and sensitivity. Adrien Ouaki is the winner of the last edition of Bucharest International Dance Film Festival. 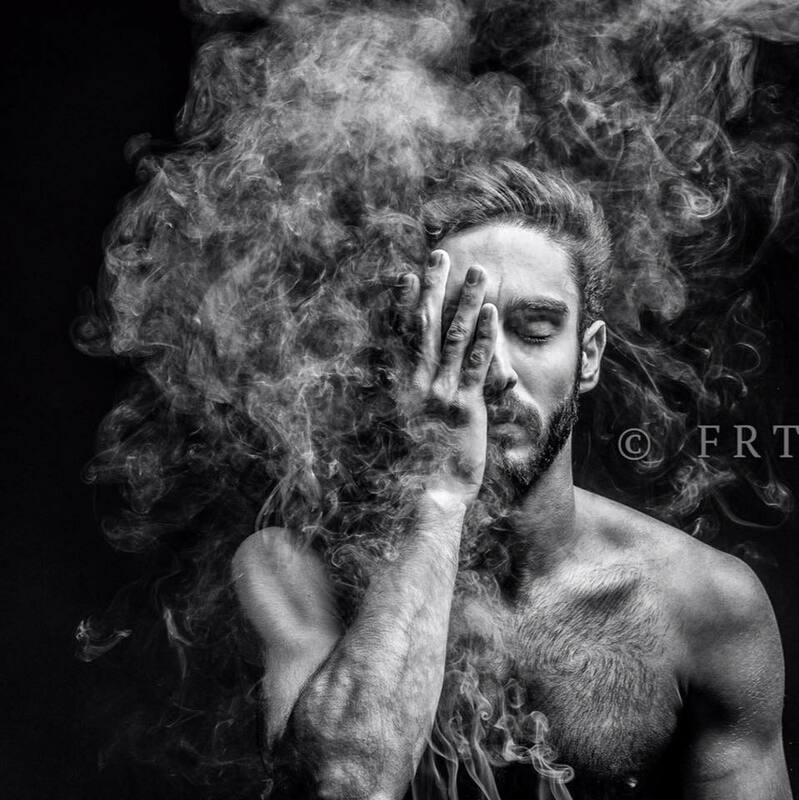 His powerful and emotional aesthetics combine dashing choreography with a cinematographic approach. The workshop introduces the participants to his technique and method of working with movement through exercises, improvisation and choreographies. Fluidly shifting from vertical to horizontal, Adrien will offer a glimpse of his creative vocabulary. A couple reunites after having spent several months each in different hospitals, as a result of a car accident. The memories that should bring them together again seem to have faded, though, for both of them. 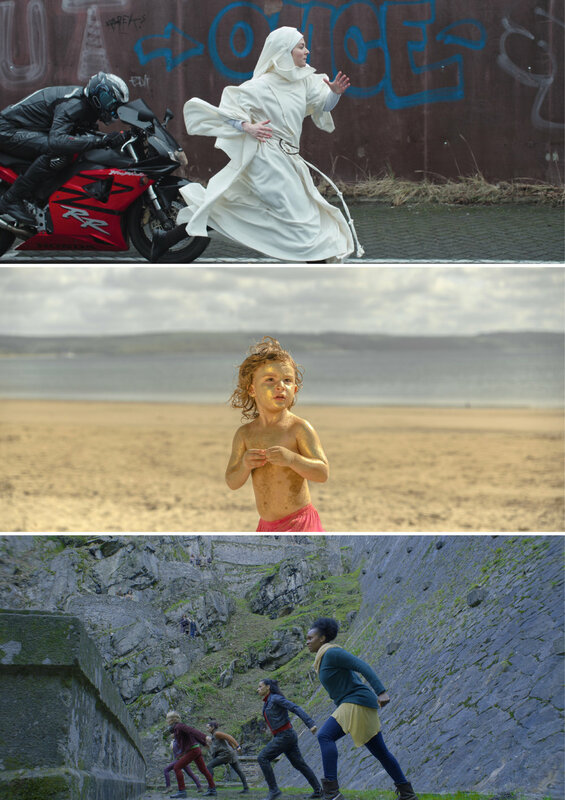 Starting with 2016, BIDFF has concentrated a significant part of the festival’s resources towards supporting the local creative industries in the production of dance films. Two years laters we see that the number of festival applications has tripled and creative duos of choreographs and directs are beginning to emerge. On the other hand, the national competition demonstrates that the lines between the artistic genres and generations are beginning to blur. We present here a surprisingly varied selection, where the body is facing its own weaknesses as well as the society, through images that deconstruct, multiply or alter it’s presence. Bucharest International Dance Film Festival invited dance film creators from SE Europe ( Romania, Moldavia, Ukraine, Hungary, Serbia, Bulgaria, Poland, Czech Republic, Russia, Slovakia, Belarus, Croatia, Bosnia and Herzegovina, Albania, Montenegro, Greece, Turkey) to apply for a brand new dance film lab, focused on the development of a dramaturgical structure and a clear artistic approach for future dance films. The lab helps dance filmmakers to further improve their initial idea in workshop sessions with choreographer and filmmaker Helena Jonsdottir (IS) and dance dramaturge and writer Guy Cools (BE) and focus groups coordinated by film producer Anamaria Antoci (RO) and film consultant Alex Traila (RO). Directed by Finnish choreographer Johanna Nuutinen in collaboration with filmmaker Jukka Rajala-Granstubb, the multidisciplinary work IRIS explores the themes of strength, desire, and survival through the mediums of dance and film. It weaves together the mesmerising live performance of two internationally renowned Finnish dance artists, Jonna Aaltonen and Eero Vesterinen, with six short films that include performances from top artists of the Finnish and Swedish dance and circus field. The work results from the interviews of 17 people in their 80s to 90s, which started with the question of what they want to speak about when there is not much life left to live anymore, and which type of memories have been the most meaningful. The result is distilled into five surrealistic stories which create a journey traveling between the sensitive stage scenery and raw landscapes on film. Exhuberant and witty, Hail the New Puritan is a simulated day-in-the-life "docufantasy" starring the British dance celebrity Michael Clark. Atlas' fictive portrait of the charismatic choreographer serves as a vivid invocation of the studied decadence of the 1980s post-punk London subculture. Contriving a faux cinema-verite format in which to stage his stylized fiction, Atlas seamlessly integrates Clark's extraordinary dance performances into the docu-narrative flow. The members of this year’s jury are Gabor Pinter, the artistic director of Parallel Arts Foundationl, Icelandic choreographer and director Helena Jonsdottir, and Adrien Ouaki, director and grand winner of BIDFF 2017. Each year, BIDFF awards socially involved creators, change catalysts, those who dare to confront the world we live in or celebrate life. The Best Romanian Film out of the 10 selected short films will receive a 1000 euro prize, offered by the Romanian Cultural Institute. Out of the 20 shorts films presented in the International Competition that are competing for the Best Film Award, BIDFF offers a 1000 euro prize to the film that impacts the festival jury most. The Award for Innovation rewards its recipient with 500 euro and will be granted to a film that innovates the relation between cinema and dance. The audience has the chance to pick their favourite and BIDFF will count votes for The Audience Award. BIDFF is a cultural project financed by Tangaj Dance. 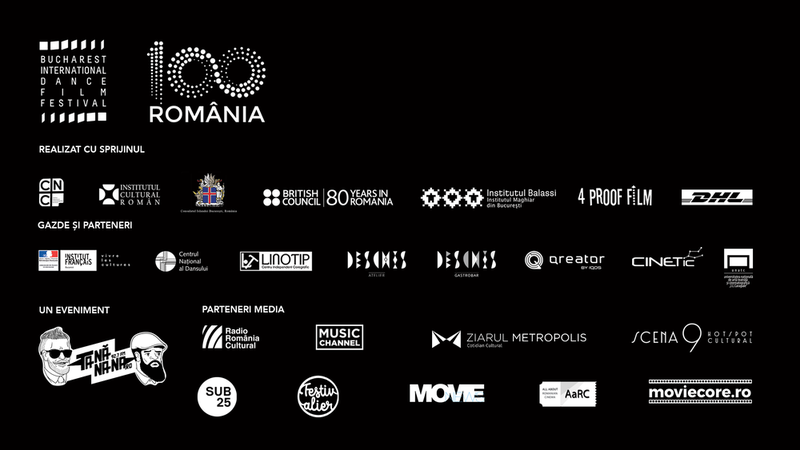 Supported by: Centrul National al Cinematografiei / Romanian Film Centre, Institutul Cultural Român, Consulatul Onorific al Republicii Islanda la București, British Council Romania, Balassi Intézet - Bukaresti Magyar Intézet/Institutul Maghiar din București, 4 Proof Film și DHL Express Romania. Partners: Cinema Elvira Popescu (Institutul Francez din România), Centrul Național al Dansului București, Deschis Atelier & Deschis Gastrobar, Linotip - Centru Indepedent Coregrafic, Qreator by IQOS. Project financed by the Ministry of Culture and National Patrimony (Romania).